BY PÉTER I. PÁPICS. The Mercator telescope is the crown jewel of the Institute of Astronomy. 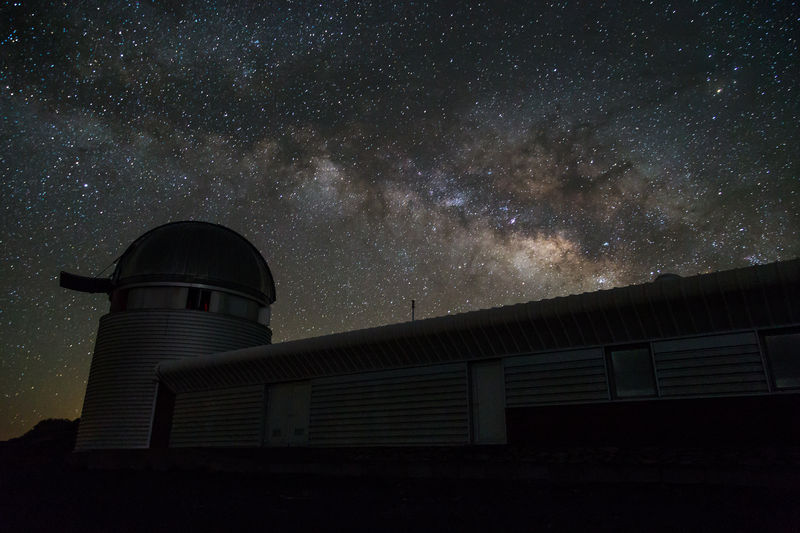 Every year we make the pilgrimage to La Palma to gather data and spend some quality time with the stars. Let me tell you about the highlight of my year in research. Péter I. Pápics is a post-doctoral researcher at the Institute of Astronomy. His main research interest is the asteroseismology of massive stars. In his free time he is a passionate road cyclist and a keen photographer. You can find him on twitter at @papics. An extended version of this blog can be found here. 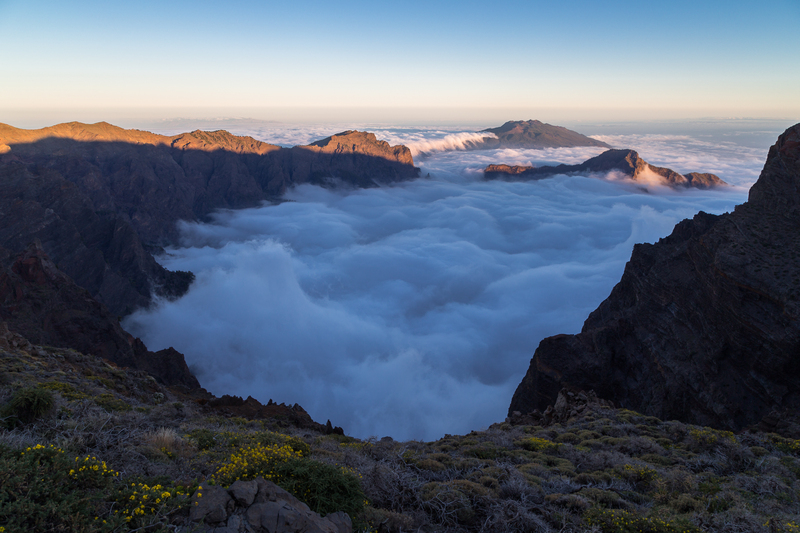 La Palma on the Northwestern edge of the archipelago of the Canaries is three times smaller than Tenerife, and its total population is only one tenth of the inhabitants of the main island – in other words it is roughly equal to the number of residents in Leuven. La Palma is famous for its hiking trails and its amazing dark, clear skies. Both are – at least partly – thanks to its special climate and volcanic history. It is one of the steepest islands in the world. Concerning the weather, few can compete with the number of clear nights and the quality of the air (meaning low humidity, and laminar, non turbulent airflow) here. We all know that time is money, and this is especially true for observing time at a professional astronomical telescope. Nowadays the available telescope time (the supply) is much less than the time astronomers would like to have (the demand). This means that researchers need to spend more and more time on writing observing proposals every half year to get time on a telescope. Then a large percentage of these applications are not even approved. This makes longterm studies especially difficult, since there is no guarantee that one will get observing time again a half year later, and so on. Our main advantage with the Mercator telescope is that since it is operated by us, we can define a few longterm monitoring campaigns that run parallel with programs that are defined on a semesterly basis by members of the Institute of Astronomy, or other collaborating partner institutes (e.g., some time is always given to the Spanish community since the telescope is built on Spanish ground). 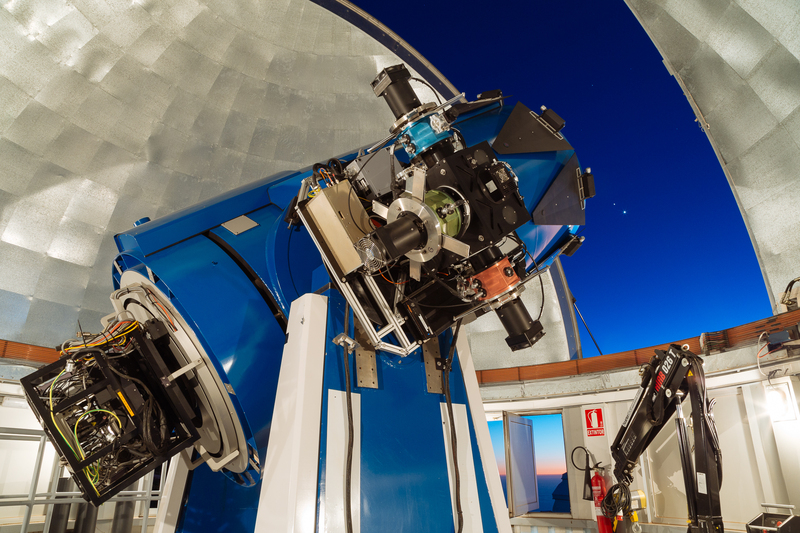 The main science drivers at the telescope are therefore related to a wide range of variable phenomena observed in stars and galaxies over different time scales. But how does ‘observing’ work in practice? Observing is the oldest task of an astronomer, it is our fieldwork. Also, most people outside astronomy think that observing is all what we do (or – in worse cases – that we can tell the future or the weather): they tend to imagine astronomers sitting behind their telescopes on top of their ivory towers, looking at stars night after night, discovering new objects every day. Luckily or unluckily – opinions differ – this romantic image does not hold anymore. Most of the time we work during the day, analysing data with scripts we write on our computers, trying to understand the specific physics hiding behind the data. As more and more observational data is coming from space based instruments or robotic telescopes, actual field work amounts for less and less time of the researcher. An average PhD student or postdoctoral fellow at our institute spends only one observing run of ten or eleven nights at the Mercator telescope per year. Observing runs are special. Some people love them for the scenery or for working with an actual telescope like every astronomer did back in the old days, but some people try to avoid them because they find it too difficult to work during the night, or to spend so many days alone in a control room. It is definitely something different compared to our everyday tasks, and even those who love it say that it is not an easy job. Although La Palma is not as far as Chile for example, getting to the observatory still takes at least more or less a half day of travel. Most often we fly via Madrid, then take a taxi from sea level to the observatory. Here we stay at an altitude of 2145 metres in the Residence, which is kind of a small hotel for astronomers and the technical staff linked to the observatory. There are rooms where astronomers who work at night can sleep during the day in total darkness, and there are some rooms where solar astronomers or technicians sleep during the night. There are also communal areas; a canteen, a small kitchen, a table tennis table, and so on. Most of the time we come here one day early, so we can adjust to the rhythm of the night shifts of the coming days easier. Some people also have slight problems due to the altitude, but after a few days everything should feel more or less normal. If the weather is good, then we only stay at the Residence to sleep and eat. The latter is also the only chance to have some social interaction for us (with the astronomers working at other telescopes), because the rest of the time we spend alone in our control room. The first night of a run is always an exception, then the observer receives an introduction from one of our local staff members about the telescope and the system. The Mercator telescope itself is 2.7 km further up on the mountain at an elevation of 2333 metres. Most people drive up here after dinner with ‘Jimmy’ the Mercator car, while especially in the warmer summer months some people prefer to walk a half hour instead. I have now spent more than 100 nights here: sometimes I caught a ride with another astronomer going to the neighbouring telescope, but during the first years I have flown my racing bike over to have some cycling holidays after the observing run and used it also to commute between the Residence and the telescope, while this summer I ran up and down every day. Driving is definitely the fastest, but not doing any sports for almost two weeks is really not healthy – especially when you love Belgian chocolate as much as I do. We start working already before (the mostly spectacular) sunset. The Mercator telescope is one of the most user friendly work environments on the mountain, thanks to our amazing staff of astronomers and engineers in Leuven and La Palma. When the system is ready and the weather conditions are permitting, we open the dome at sunset, then at the end of the nautical twilight (when the Sun dipped 12 degrees below the horizon and the sky is dark enough) we start executing the list of observations that we had prepared on the afternoon. It varies significantly what people do with the time that they have while monitoring the observations. Due to the altitude, the night time, and the fact that you still need divide your attention between the screens of the observing system and your own computer, everything requires much more effort. Everyone agrees that catching up on email is a good thing to do, but anything where regular interruptions are not too disturbing is a good candidate. Then again, some people do their best science – either coding or writing – at the telescope, because they are not being interrupted by anyone else. I like to use this time to do outreach related activities, for example taking photos of the night sky, making timelapse movies of the observatory, or writing articles like this one. Sometimes I like to step outside for a while, wait until my eyes get adapted to the perfect darkness you never see from Belgium, and just look at the Milky Way, to remind myself that all the programming I do on the computer is to discover the secrets of the cosmos around us. It might sound very cliche, but I became an astronomer because I loved looking at the sky when I was little and wonder about the stars, and I am still motivated by the beauty of the universe. It is a shame that with all the light pollution we have in Flanders (and everywhere in the developed world), it is not possible to see most of these wonders anymore. I always return home to Leuven not only with Gigabytes of data, but with my motivation recharged for the coming months. The last (but of course not least) thing I want to talk about is another reason why the Mercator telescope and the Institute of Astronomy of the KU Leuven are special. As part of our Master of Astronomy and Astrophysics we offer two special courses. During the first course students need to work in teams of two and prepare an actual observing proposal for the Mercator telescope with real scientific goals that can lead to original discoveries and even publication in a refereed journal. It is quite often that students carry these topics further and build their Master Thesis around them. At the beginning of the second semester all students travel to La Palma (and since 2010 I come along as support astronomer to help during the nights) to carry out these observations at the Mercator telescope. 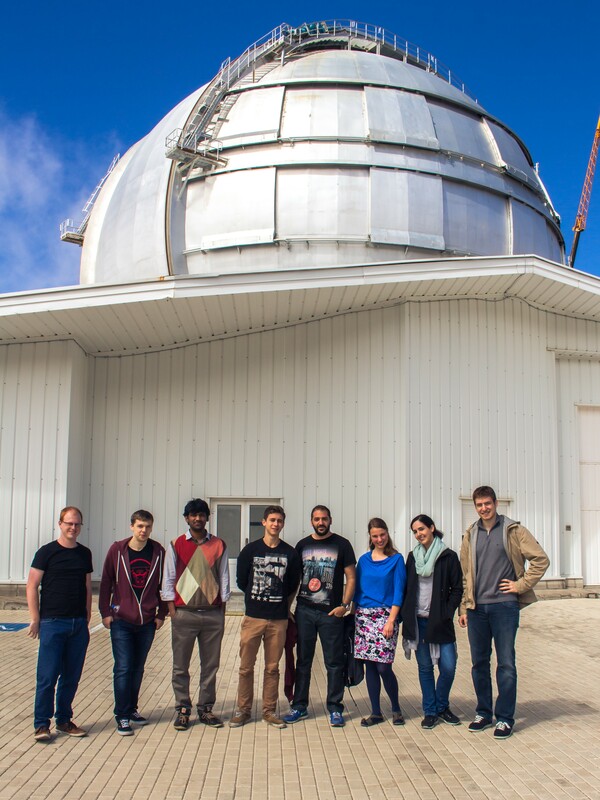 They learn how to work at the telescope, how to schedule time-critical observations, how to analyse their data, and how to write down their results in a professional format. These two courses thus teach the students about the whole scientific process. This gives them a huge amount of experience that will be useful should they decide to continue in the field. All in all the Mercator telescope is an extremely important asset for us, it is not only an irreplaceable source of astronomical data, but also a unique teaching environment for students in our Master education. It also provides plenty of opportunities to build new collaborations with astronomers outside our institute, or conduct special outreach activities. It might be right to call it the crown jewel of the Institute of Astronomy of KU Leuven. Dit bericht werd geplaatst in Onderzoek, Universiteitsleven. Bookmark de permalink .